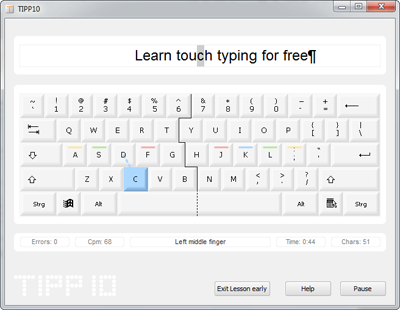 TIPP 10 Download We present an impressive free program for pc with which you can learn typing with the keyboard of your computer quickly and easily. With TIPP 10 2.1.0 you will gradually learn to write faster and faster with the keyboard of your computer. 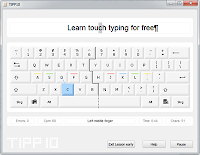 This learning program makes it easy and fun to learn free typing on your pc. TIPP 10 2.1.0 has 20 lessons very well configured so that you go from less to more in practice with your keyboard and improving as a typist in a short time. In each lesson you will have to get used to using different combinations of letters with different exercises well explained and detailed. You can watch your progress with this free typing program thanks to a results report that TIPP 10 2.1.0 will present you after each exercise. This report is quite accurate, with statistics of errors, characters per minute, error rate per finger, error rate and frequency per character, all very detailed so you know where you are failing and improving.